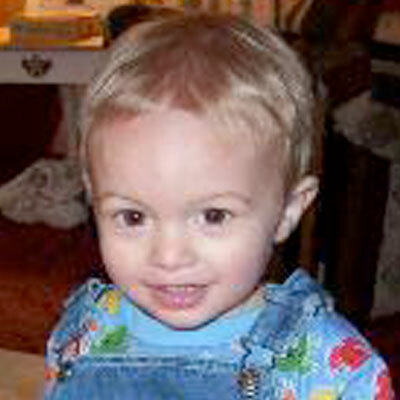 13-month old Jackson was diagnosed with ARDS on August 3, 2002, at Children’s Hospital in Birmingham, AL. The day before, he was a normal 13-month-old little boy. Jackson was staying with Jennifer’s sister while Jennifer went to a wedding rehearsal and became very sick. Upon her return, Jennifer suggested that he had a stomach virus that perhaps he more than likely picked up at his daycare and she made plans to take him to their local emergency room to see if he needed fluids for dehydration. Once at triage, Jennifer was informed that his O2 was only 39% and Jackson was immediately taken to a room and put on an oxygen mask. After what seemed like several hours, they transferred Jackson to Children’s. During the night in the waiting room of PICU, Jennifer and her husband, Scott, were unable to see him or speak to anyone. It wasn’t until the next morning that they permitted only Scott and Jennifer to come back and see Jackson. He was swollen and pale with discolored splotches all over him. He had been placed on an Oscillator at 100% oxygen and was still only saturating at 75-85%. The doctors had no answers for them only told them that all they could do was wait for more of the test results and pray that he made it through the day. They spent the next week on pins and needles and one week later, the doctor discussed with Jennifer and Scott about stopping his life support. Jackson was totally unrecognizable, and at this point, they were not allowed to touch him or talk to him. Jennifer asked the doctor to give them one more day and then whatever he decided, they would except as God’s will. The next morning, Jackson improved just a little and they had overcome the first of many major hurdles. He remained on the Oscillator for five weeks, during which time he lost his tube and actually died twice. The doctor told them after 5 weeks that she wanted to attempt to switch him back to a standard ventilator but it was her opinion that the attempt would probably fail and that Jackson would not survive. She believed that the masses they saw in his lungs were scar tissue, which would never go away. Jennifer told her that it did not matter what was in his lungs, “if God wanted it out, He would get it out.” The transition was a success and that was the beginning of the new phase–Jackson’s slow uphill climb. He was on total life support for a total of 50 days and during that time, he had 17 blood transfusions, multiple pneumothoraxes which resulted in a total of 7 chest tubes, and at his highest point, was receiving 25 mg of Morphine, 30 mg of versed and the highest dose of paralytics that they had ever given at Children’s every hour. During the time that Jackson was hospitalized, seventeen other children died in PICU, and that may have been the most discouraging part of all. Jennifer’s husband, Scott, lost his job on the 3rd day of hospitalization and they felt their world was crashing down around them. But on October 5, Jennifer and Scott took Jackson home without any oxygen. Although they were told that he had permanent loss of 30% of his lung function, one month later his chest X-ray showed a 100% normal set of lungs. To this day, the doctors have no idea what caused Jackson to get ARDS. Though that will haunt Jennifer for the rest of her life, what matters most is that if he can overcome those odds, it gives hope to other families who are facing these same devastating odds. Jennifer feels that one of the key elements is faith and love for the person, that they can absolutely hear and feel your presence. From the time that Jackson went into the hospital until that they were able to get back on their feet, which was after Christmas, the Nolen’s hardly paid one bill. Jennifer had worked at the Daycare where her children went, and all the parents raised money to pay our bills. Her fellow employees all volunteered to work her shift on different days and clock in on her time card so she kept getting a check. They even had a complete stranger walk in and hand a $50 bill to Jennifer and refuse to give her name; Jennifer believes that she was an angel. The church that Jennifer’s boss is a member of paid their house payments through December and paid for the children’s Christmas presents. Jennifer’s Mom stayed with the family the entire 9 weeks and her employer collected funds to make up for her lost income and her church choir collected $700 to help Jennifer’s parents pay for their gas and food. It really showed the family how valuable friends and loved ones are, and the Nolen’s feel that they truly are blessed. Presently, Jackson lives at home with older brother Bryant, older sister, Holleyanna, and is eagerly awaiting the arrival, along with the rest of the family, of his baby sister, due on May 18th, 2003.